The recent publication of the Intergovernmental Panel on Climate Change’s (IPCC) Synthesis Report gives an overview of the latest science on climate change. The CCI programme made some important contributions to Assessment Report 5 (The Physical Science Basis) Working Group I, despite only being in its first phase when the report was written. The biggest input from CCI research came in Chapter 4, on Observations of the Cryosphere. The Glaciers CCI team were instrumental in putting together the Randolph Glacier Inventory, the first globally complete inventory of glaciers, available in a digital vector format. The improved spatial resolution (30 m) of the global data set is a big improvement compared to previous data sets, which has also improved the uncertainty information available with the inventory. Frank Paul, the Glaciers CCI science leader was a lead author in the chapter. Rastner et al., (2012). The first complete inventory of the local glaciers and ice caps on Greenland. The Cryosphere, 6, 1483-1495. Ice Sheets CCI member Andy Shepherd led a joint ESA-NASA workshop, the Ice Sheet Mass Balance Intercomparison Exercise (IMBIE) that produced a reconciled estimate of ice sheet mass balance changes in Antarctica and Greenland, and their contribution to sea level rise from the satellite community. This topic was highlighted by the IPCC as a primary emerging topic in 2010, so the IMBIE group was assembled in order to provide a response in time for the 2013 WG I report. Shepherd et al., (2012). A reconciled estimate of ice-sheet mass balance. Science, 338, 1183-1189. Closely linked to glaciers and ice sheets but covered separately in Chapter 13, is the issue of sea level rise. CCI Sea Level produced improved Global Mean Sea Level estimates using Envisat data, which was used in the IPCC report. 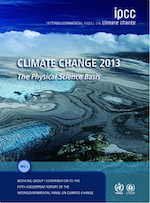 The Sea Level CCI Science Leader, Anny Cazenave, was a lead author on the chapter. Gardener, et al. (2013). A consensus estimate of glacier contributions to sea level rise: 2003 to 2009. Science, 340 (6134), 852-857. The work done by Sea Surface Temperature CCI with the (A)ATSR series of measurements was highlighted in Chapter 2, Observations of the atmosphere and surface. The SST CCI data set has improved the understanding of uncertainties and biases in SST records. Chris Merchant, the SST CCI Science Leader, was a contributing author to Chapter 2. Looking forward to AR6, the CCI projects will have had a chance to improve their data products with feedback from their climate research groups and hope to make an even better contribution to the IPCC assessment reports.